Target Training: Strength, 9 mins 4x week. Develops triceps, biceps, shoulders and back, intensifies ab exercises, improves grip strength. 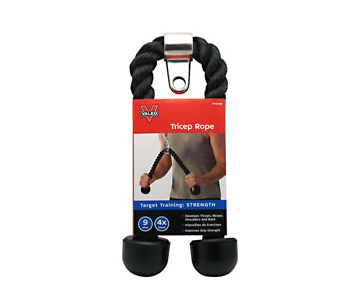 Tricep Rope, amplify the results of crunches, kickbacks, curls and other weightlifting moves with a Tricep Rope. 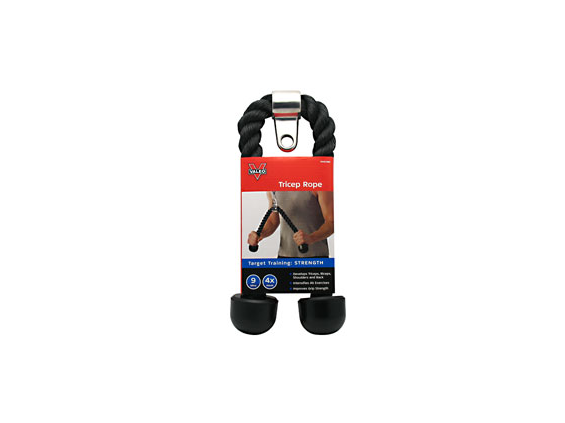 28 inches coated nylon rope with solid rubber ends, durable chrome-plated attachment, connects to any universal gym system. Target Training: 9 minutes, 3 times a week, is all you need to target your: Upper body, including all core muscle. 3 sets, 10 reps: Benefits: The Tricep rope connects to a gym system to target your triceps, biceps, shoulders and abs. Trainging recommendations and results are derived from a typical workout program, based on a 150-lb, individual. Your specific results may vary. Consult your physician before beginning this or any new exercise program to check for physical limitations that could create a safety or health risk. Do not continue to exercise if you experience pain. Important: Check the product before each use. If the product is worn or damaged, Stop using it immediately. Do not use for any purpose other than the intended applications as shown by any of the instructions, illustrations or DVDs.